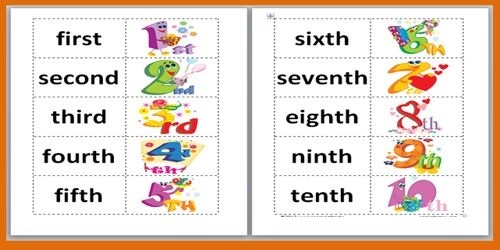 An Ordinal Number is a natural number used for ordering (e.g. 1st, 2nd, 3rd, …). It is a number that tells the position of something in a list, such as 1st, 2nd, 3rd, 4th, 5th etc. In formal set theory, an ordinal number (sometimes simply called an “ordinal” for short) is one of the numbers in Georg Cantor’s extension of the whole numbers. 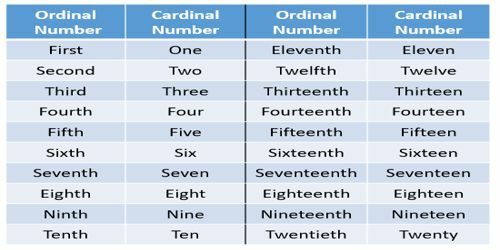 An ordinal number is defined as the order type of a well ordered set. It is easy to see that every finite totally ordered set is well ordered. Any two totally ordered sets with k elements (for k a nonnegative integer) are order isomorphic, and therefore have the same order type (which is also an ordinal number). The ordinals for finite sets are denoted 0, 1, 2, 3, …, i.e., the integers one less than the corresponding nonnegative integers. Two well ordered sets have the same order type if and only if there is a bijection from one set to the other that converts the relation in the first set to the relation in the second set. Can you see the last two letters of the words make up the ordinal number? 2018th = two thousand and eighteenth. She was hired on January 8, and on the 25th she got appointment letter from board of directors. The first three series were wonderful to watch, but the second two were quite boring. Can’t you wait till March twenty-fourth? A boy of 20-years old, sitting with his twin brother remembering their eleventh birthday, which was celebrated with their family at an amusement park.